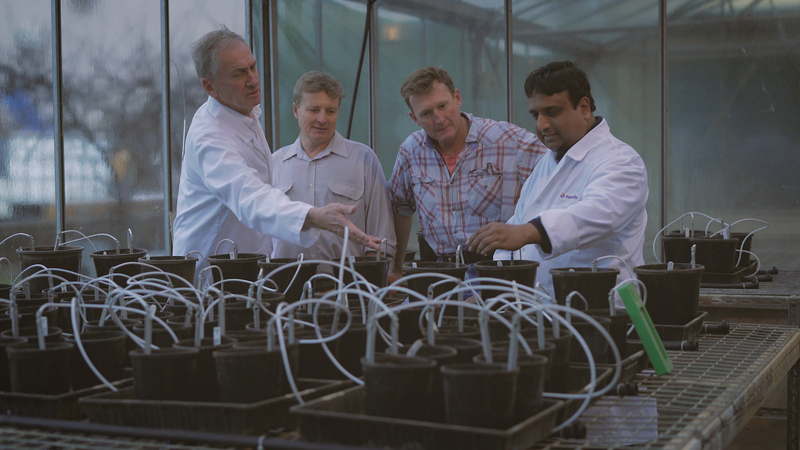 Image: Researchers from Eurofins Agroscience Australia (far right and far left) shoe Soil C Quest’s Mick Wettenhall and Guy Webb (centre) how research into inoculums is progressing. Image supplied. A bold new project aims to put the future of food security and climate change firmly in the hands of farmers, through the development of ‘game changing’ biotechnology. A newly formed non-for profit research and development organisation is exploring the potential for the humble fungi to be used to create and store large amounts of carbon in the soil. Soil C Quest is extending initial research by The University of Sydney that discovered the potential for soil microbes to ‘capture and build soil carbon at unprecedented rates’. ‘The University of Sydney study sourced isolates of fungi from the Sydney basin area. Of those, 24 showed a statistical increase in soil carbon over a 14 week period, and two or three showed a significant increase in soil carbon’, explains Guy Webb, CEO of Soil C Quest. Trial results also detected a mild increase in crop growth indicating that there could be a host of additional agronomic benefits if the biotechnology can get to a market-ready stage. Soil C Quest was formed to further the research, initially conducting a field trial to test the inoculum in canola which showed a 30% increase in soil carbon in 30 days. ‘We’ve had success increasing soil carbon under canola, cotton and sub clover, and part of the research we’re doing now is identifying the specific fungi that will be able to increase soil carbon in other crops and different climate zones’. For farmers, particularly continuous croppers, the prospect of being able to build soil carbon through a simple seed inoculant represents an opportunity to increase yields using fewer inputs, leading to increased sustainability. An essential feature in all landscapes, carbon is the pillar of soil fertility, directly influencing soil’s ability to hold water, cycle nutrients and make nitrogen available for plants. Experts speculate that between 50% and 80% of organic carbon in the surface of Australian soils has been lost since European settlement, contributing to the ever-increasing input requirements of modern farming systems. The biotechnology being explored by Soil C Quest has the potential to reverse many of the issues caused by land degradation. An increase in soil organic carbon from just 1-2% can store the equivalent of an extra 30 units of nitrogen/hectare, as well as increasing the capacity of soil to hold water. Consider that against the initial trial where soil organic carbon increased by 30% in 30 days and the sustainability of farming systems seems all the more positive. As well as the benefits to the agricultural sector, biotechnologies like the Soil C Quest project offer a contingency plan for the effects of climate change. Human activities like deforestation and the burning of fossil fuels have contributed to an excess of carbon dioxide being released into the atmosphere, one of the main contributors to the greenhouse gas effect. ‘Locking carbon up in the soil is a really cheap climate change mitigation tool. Effectively it will be paid for by farmers, they’ll deploy the technology at a scale given one billion hectares is cropped globally every year’. ‘The current level of carbon dioxide in the atmosphere is 400 parts per million, and that needs to be reduced to 350 parts per million to start reversing global warming. A 10% increase in global soil carbon stores annually could theoretically remove around 10 parts per million of atmospheric carbon dioxide each year’. In an effort to continue research in this area, Soil C Quest will be launching a crowd funding campaign at the NSW state Landcare conference in October this year.